It is the mantra of every HVACR contractor that preventive maintenance can save you money for many reasons – avoiding service calls, extending the useful life of equipment, and improved unit efficiency – but who will believe the guy who SELLS maintenance contracts to give you advice on maintenance? Am I right?!? So, I stumbled across this blog from Goodway (OK, they’re a seller of maintenance tools , but stay with me here!) that quotes tests performed by the Canadian government to cite the savings. If you can’t believe the Canadian Government, who can you believe? So check out the article below for the details on what your boiler maintenance really can do for you, eh? One problem you see with boilers in large institutions such as schools and universities is that cleaning and maintenance can be overlooked. 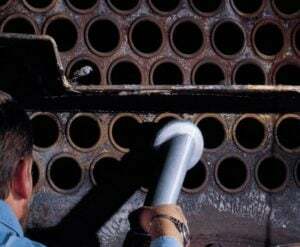 This is often because boiler maintenance is not in the scope of work for HVAC maintenance staff and falls in the scope for the plumbing staff, who often don’t realize it’s part of their duties. It’s also often a misconception of staff that the highly intuitive controls that most new boilers have will prevent issues and send alerts when they occur, but controls are primarily responsible for boiler function boiler maintenance is still imperative for optimal operation. Otherwise, a boiler can sit for years, gathering scale and dirt that affects performance and can even ca use premature malfunctions and breakdowns. Boiler issues can be a real problem and they can happen quickly. For example, tests show that a soot layer just 0.8 mm (0.03 in.) thick reduces heat transfer by 9.5 percent and a 4.5 mm (0.18 in.) layer by 69 percent. As a result, the flue gas temperature rises – as does the energy cost. Scale build up on the water side of tubes, from deposits of calcium, magnesium, and silica found in water can also cause issues by insulating tubes and reducing heat transfer. Build up of soot and scale can happen in a few short weeks, so it’s easy to imagine how a boiler that has been neglected for months or even years can gather sediment that has major implications on performance and premature malfunctions. The way to keep a boiler healthy and operating at its highest efficiency is to have regular maintenance performed on it. But maintenance also requires that tubes are cleaned properly to remove all the soot and scale buildup which can be difficult to remove. Goodway has fire tube and water tube cleaning systems that make removing even the smallest amount of scale and soot a snap. They have a variety of systems in various sizes that make it easy to clean any size or length of tube. They have tools that will brush out the scale and soot from the inside while simultaneously vacuuming loose particles from tubes, improving the efficiency of even the most neglected boiler. Additionally, chemical cleaning is a fast and effective way to remove water-based deposits like limescale from tubes. We recommend cleaning oil boilers a minimum of once per year. It is not in your best interest to neglect your oil boiler. Standard efficiency gas boilers are a little more forgiving, and might be OK with cleaning every other year depending on the environment and operational factors. , unless they are high efficiency, which require more tender handling.